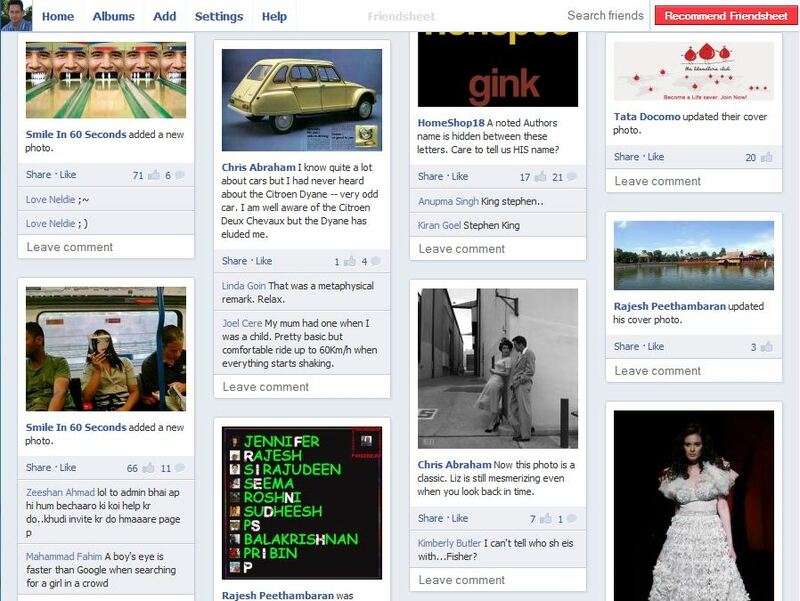 Freindsheet is a new Facebook app, which allows you to browse Facebook Photos in Pinterest style. The new app is created by Zach Allia, which turns all the Facebook photos from your news feed into a Pinterest style. Freindsheet is a free to use web app which displays all your public Facebook photos in small panels, just like popular social bookmarking site Pinterest showcases images on Pinboards. It give you the the feel of Pinterest pinboard. With the help of Freindsheet app you can views all your Facebook photos at one place and also you can comment, like, and search photos, and upload right from the Friendsheet app. It give you also the setting option from where you can hide caption, hide albums or hide fan pages. To start with Freindsheet all you need to access this app from your browser, just go to the Freindsheet app page here and click on the Login with Facebook button. After the login with your Facebook account, then grant permissions to the app. So the Friendsheet app will turn all your Facebook Photos into Pinterest style. Once done, now you are able to view all your Facebook and Facebook Friends photos in Pinterest style. Now you can click and view any of the images here and able to like the photo and leave comments. And from the Above option you can change the setting of the Friendsheet page or watch you on Facebook Album photos. Thats it, now all you Facebook Photos and Albums are in one place, from here you can like any of the images and also comment on them. Also views all of your friend pictures and album by clicking your Facebook friends name or using search option from the top. So lets us know what to so think about the Freindsheet app, is it really useful to views Facebook photos like Pinterest. Give the app a shot and then leave your comments you like it or not.